Portland alt-countryish rockers Blitzen Trapper take to the road with an accomplished sixth album steeped in a bygone America. Last year, some speculated that the sixth album by Portland's Blitzen Trapper might see the band enter some kind of cosmic-progressive phase. The logic, such as it was, went that their Queen-inspired miniature rock opera "Destroyer of the Void" was indicative of the group's future plans, where the last album's other songs were not. However, borrowing from a host of '70s influences is just what Blitzen Trapper does. Had they chosen another song from the last album, critics might just as well have predicted the band would become full-time Laurel Canyon folkies, don leather for hard rock, or disband altogether allowing frontman Eric Earley to transform permanently into Bob Dylan. Thankfully, none of those things happened. 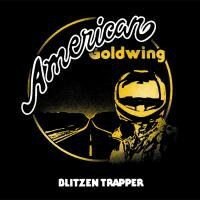 On American Goldwing Blitzen Trapper remains true to itself -- still inspired by its heroes, still fusing old sounds with new, and still compelling. A fat slice of the credit for all this is due to Earley, the man Robin Pecknold of Fleet Foxes once memorably called "a supergenius". He had a point -- it takes real songwriting smarts to have a little magic from CSNY or Dylan rub off on a song without it becoming too reverential. With these new tunes, Earley more easily walks that line by reining in his influences to a certain extent. Having gotten an epic like "Destroyer of the Void" out of its collective system, Blitzen Trapper is able to focus more closely on American roots music this time around. Indeed, American Goldwing is framed within a warm nostalgia for a kind of imagined, bygone America. This is a place the band has been to before, of course. They have at least edged around it in the folk narrative of a song like "The Tailor", but here they leap in completely. From its title to its instrumentation, this is an album steeped in the hazy atmosphere of the road, one littered with rusted pickup trucks, discarded Schlitz cans, and broken hearts. This is a very specific kind of Americana, explored using both lilting country balladry as well as ragged, stomping rock. While the group's experiments with different song styles don't always come off -- experimenting is like that -- the stronger songs here can stand alongside Blitzen Trapper's finest work to date. While "Taking It Easy Too Long" is a disappointment -- a mournful country tale too arch and familiar to work -- something like "Love the Way You Walk Away" is much more representative of the quality here. Not unwisely given away as a free teaser MP3, it builds woozy guitar and harmonica around Earley's story of inattentive love and is perhaps the best achievement of this record's softer side. Elsewhere, "Street Fighting Sun" is one of the most irresistible rockers Trapper has yet recorded; as drums beat an uncommonly raucous vocal out of Earley, someone brandishes about a great dirty guitar riff and makes like he means to use it. As far as best moments go, a guitar break which briefly brings to mind Black Sabbath's Tony Iommi wrestles with Earley's squealed realisation that "the sun, it ain't so easy to kill." If there's a point at which the record's country and rock sides merge most cleanly -- and so provides a useful litmus test for new listeners -- it has to be opener "Might Find It Cheap". While an electric guitar workout for much of its length, the track has dueling acoustics under its surface, and makes a feature of a broken-down mid-section which threatens to break out into a full-blown hoedown at any moment. At the album's other end, "Stranger in a Strange Land" strips the sound back to vocals, acoustic, piano, and occasional harmonica as Earley brings back the uniting notion of the road, here depicted as "the highway / Which runs far but never my way / Don't you know." As full as it is with the debris of a scattered America-that-was, this record is so much more than a compendium of Old West or dustbowl clichés set to music. At its core, ultimately, is a set of accomplished and delicately crafted songs. Blitzen Trapper still have a way to travel yet, but American Goldwing is a more than a homely waypoint on the road and reason enough to wonder where the band's imagination -- and yes, its influences – will take the group next.